Manal AlAlem One of the most famous Arabic chefs in the Arabic community worldwide, she has her own cooking centers in Arabic countries, many cooking books, her own series that she produces and presents on TV, and now her very own iPhone app. So, does the app live up to the standards of her cooking? Yes it does, as this is an interesting and unique app that encourages good cooking, while keeping the content fresh and new. The interface is rock solid, and you never feel lost or that the content overwhelms you, as it is presented in such a way as to always feel helpful and friendly. It is great that these recipes are now available in English, which should give them a broader appeal, especially on iPhone. The app allows you to browse recipes by category, to search all the available recipes, and even to add the ones you like to an easily accessible favourite list for future reference. 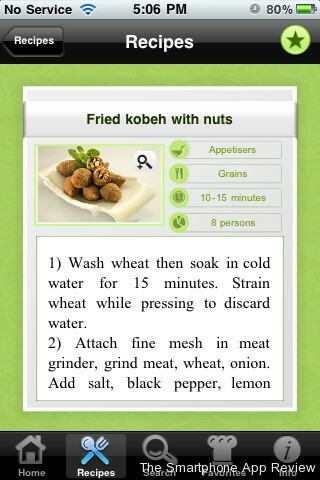 Overall, this is a good little app that is sure to broaden your culinary horizons.